Rotary Clubs are invited to participate by donating a set of magnifying microscopes, emblazoned with the Rotary emblem, to primary schools. The project works best when a primary school is given a set of 30 microscopes with a supply of 30 EverReady AA batteries (not included – available from your local post office or IGA). Please do not supply lithium or alkaline batteries as they are too powerful and may blow the globe. 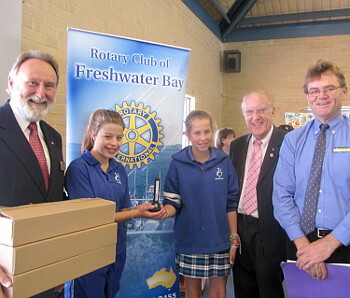 Rotarians should present the microscopes to the school at an assembly. Each Magnifying Microscope costs $15 – a full set of 30 units costs $450. Once an order has been placed, an invoice is sent to the club. Microscopes will be available for collection or mailed out once payment has been received in full. Postage can be arranged to clubs outside the Perth metro area.